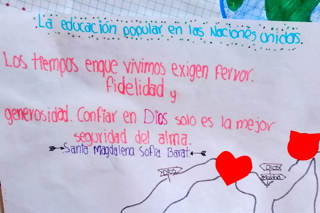 Learning and living JPIC at the school fair of Escuela Guadalupe in Mexico. 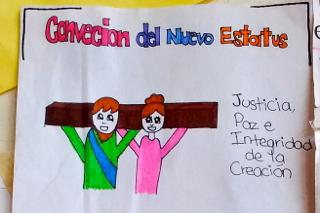 What do a school fair, the feast of the Sacred Heart, JPIC, and the possibilities of the internet all have in common? 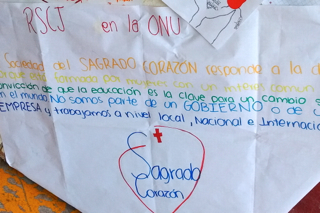 At the Escuela Guadalupe, we thought that the feast of the Sacred Heart would be a good opportunity to make more visible the mission of the Society, especially the actions taken around the world in support of Justice, Peace, and the Integrity of Creation. Although at first we thought about assigning a country or a specific project to each grade, we decided in the end that each group would investigate on their own. They would “surf the internet” and decide which project seemed interesting to them. They wrote or drew their discoveries on large poster boards and used them to decorate the stalls of the school fair. 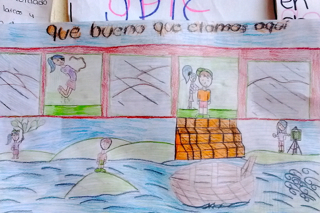 Because of this, we could find a bowling game put together with information about “Comunidad Crece,” (a popular education project in Guadalajara, Mexico). Or, we could buy sweets in another stall and read about our mission in India at the same time. Bingo was adorned with the flags of Spain and information about how our sisters are living our mission there. 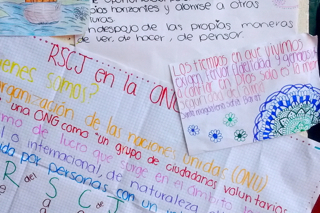 Anne Corry rscj and Yolanda Jiménez had sent us materials about JPIC and the mission of the Society. 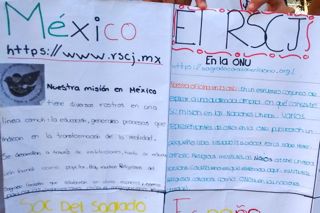 We shared this with the teachers as a point of reference, but we ultimately decided that the boys and girls themselves were to discover our mission through the different web pages for our provinces and especially our sites, https://rscjinternational.org and https://sacredheartattheun.org. This year, the theme of the school will be “Setting Sail Together to Reach New Frontiers.” Now, I think that these new frontiers can also reveal themselves by way of investigation, curiosity, and the desire to go beyond what we already know.